Since 1974, our ultimate purpose for this association has been to provide a unified youth sports program with the major emphasis on the fun and enjoyment of all youth interested in playing and developing football and cheerleading skills. This association is dedicated to instilling "PRIDE" in our youth. 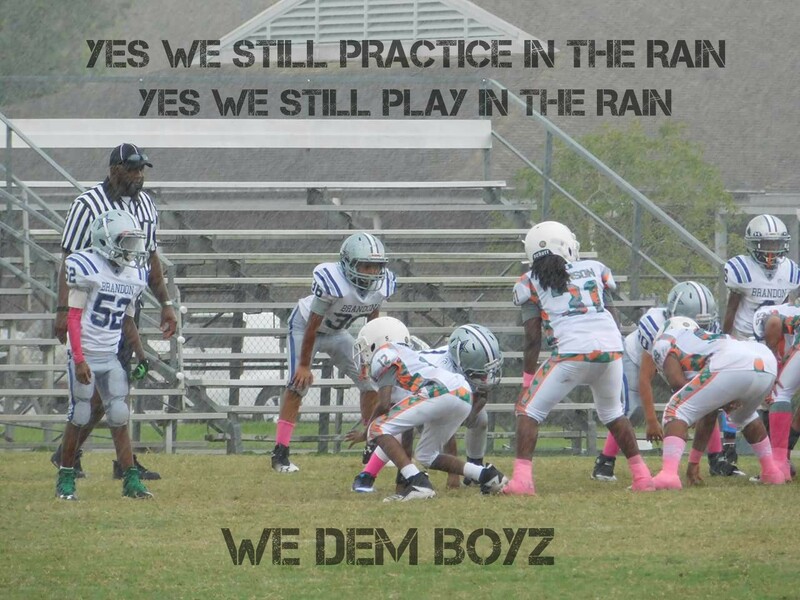 WE PRACTICE IN THE RAIN!!!! The flags are hung up by the board room so they are visible for everyone to see, If it is a yellow flag we ask you stay in your car until it has been deemed ok to practice. We have one mission at Happy Sailor Printing. WE WANT TO MAKE YOU HAPPY!!! Happy Sailor Printing provides printing services to the greater Tampa Bay area and beyond. We have a range of products from T-shirts to Sweatshirts and more. We handle everything from Vinyl to DTG (Direct to Garment) printing. We use the latest in technology and innovation to provide products that will not only give high quality appearance, but will last for years to come. Our service is something you can rely on too, Shipmate! Eagles are community leaders. Since 1898, the F.O.E. has played a key role in the creation of Mother’s Day, Social Security, Medicare and more thanks to a dedicated membership base working daily throughout the United States and Canada to help friends and neighbors in need. Our F.O.E. Charity Foundation awards grants to local and international organizations to aid in patient care and prevention for a variety of causes. When you come to The Car Store chances are you will be greeted by one of the owners and treated like family. Sit on the front porch to make your stress free decision about which lifted 4x4 pickup truck will be yours. Ford? Chevrolet? Dodge? Toyota? Typically we often carry cars and suvs. ASK about out selection of motorcycles and recreational vehicles as well. We are glad to assist in making the vehicle purchase one you will be proud of and comfortable enough to bring your family and friends when they are in need of a reliable vehicle. Want to sell your RV or motorcycle? Contact us for that as well. Established in 1960 by Fano and Gaspar Ciaccio. Formally the TTL Club and Temple Terrace Cigar Bar and Grille. Still family owned and operated by Jimmy Ciaccio who renamed the bar in 2002 after the passing of his father Gaspar Ciaccio.Bring your dog and hang out with Karaoke or Billards/Darts. Our Goal is to serve the best New York style Pizza and home cooked Italian food, subs, salads, phillys, and wings possible. We provide a clean family friendly environment with a game room for the kids, sports, TV's, beer and wine for the adults and plenty of smiling faces. We offer dine-in, delivery, and carry out. Wwe sell pizza by the slice. Our other specialties include strombolies, calzones, salads, and desserts. We serve nothing but the freshest home made food while keeping our prices low in keeping with these economic times. We remain a neighborhood family friendly restaurant keeping with the tradition of quality, freshness, and customer satisfaction. Bahama Buck’s is a world where paradise and enterprise have come together to create a lifestyle experience beyond compare. Our island adventure began with a vision for the "Greatest Snow on Earth," and resulted in the Bahama Buck’s style, attitude, and eclectic taste of the tropics.Come try any one of our delicious items and see for yourself!!! TECO Energy is built on a foundation of more than 100 years of history. The company invests in electricity generation, transmission and distribution, as well as gas transmission and utility energy services with a strategic focus on transformation from high carbon to low carbon energy sources. TECO Energy has three core businesses. In Florida, Tampa Electric is a regulated utility serving more than 725,000 customers, and Peoples Gas System is the states largest natural gas distributor serving more than 365,000 customers. Brandon Rental Centers is your one stop rental resource serving homeowners, contractors, and businesses in Tampa Bay since 1973 and today has grown to 2 locations in Seffner FL and Riverview FL, covering the entire Tampa Bay, Florida area. When it's party time, we can handle everything from event planning and layout, to delivery and set up. Whether it's a backyard party, wedding, or corporate event, our knowledgeable staff is dedicated to making your event a success. We have been a Family business for over 10 years in Brandon Florida. We can start the E-file process with your last pay stub(s) and give you an Estimated refund amount (HOWEVER we do require all W2s before E-filing can be sent). We also need Any and All required Forms to begin. Kona Ice is a mobile, Hawaiian-style shaved ice franchise based in Florence, Kentucky. The company was founded by Tony Lamb in 2007. Lamb is Kona Ice's CEO. It was named one of the fastest growing franchises in the United States. Here at the Academy, we support our students by fostering academic excellence and high achievement, educating the whole child within a values-based setting, and preparing youngsters for success in life. If you want a caring, challenging, nurturing, safe and secure environment for your child, consider NLT Academy, where we believe in Achieving Excellence; Pursuing Greatness. We have one mission at Divine Creations and Events WE WANT TO MAKE YOUR EXPERIENCE Heavenly!!! We are a full service event, design, and styling company specializing in designs that are modern, original, and inspiring. Based in Florida, we provide services to clients throughout Florida, across the United States.